Although the “More Barn” story has been repeated countless times it’s worth retelling for all the new Neil Young fans. Nash says: “The man is totally committed to the muse of music. And he’ll do anything for good music. And sometimes it’s very strange. I was at Neil’s ranch one day just south of San Francisco, and he has a beautiful lake with red-wing blackbirds. And he asked me if I wanted to hear his new album, ‘Harvest.’ And I said sure, let’s go into the studio and listen. 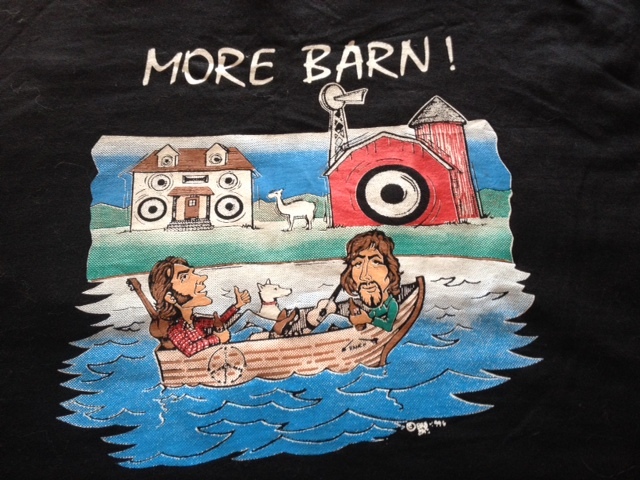 Rustie Brad Bandeau made famous the classic, not collectible “More Barn” T-shirts. by Shannon Zimmerman; Salon, 20 August 2003.